From left are United Way Director Dave Bezusko, Allix Cotterman, Nikita Scheifele and Alexis Clem of OHP/ILHS FFA and FFA Advisor and Ag Educator Tanner Schoen. 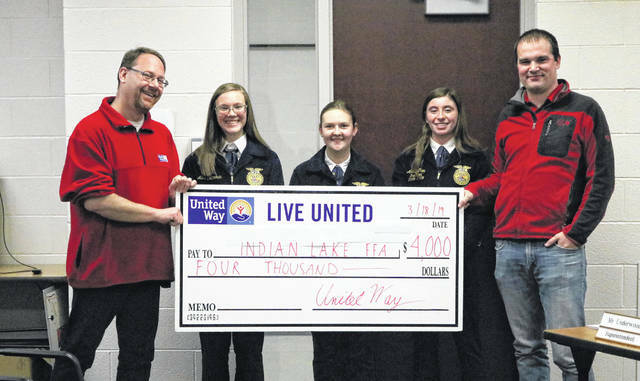 A United Way grant will help the Indian Lake High School/Ohio Hi-Point FFA Chapter hatch a more extensive chicken- and turkey-raising operation. The Logan County United Way Allocations Committee awarded the ILHS/OHP FFA Chapter a grant for $4,000. United Way Director Dave Bezusko presented the check during the March Indian Lake Board of Education meeting. FFA Advisor Tanner Schoen said the money will be used to purchase food and bedding and supplement processing fees for chicken- and turkey-raising efforts on campus. Last summer a handful of his students raised chickens in the FFA shop area. Students showed them at the Logan County Fair and won the prizes for both Grand and Reserve Champion. Their success and interest in raising the birds led Schoen to expand on the idea. Earlier this year, the Logan County Farm Bureau awarded ILHS/OHP FFA a $7,350 grant to construct a “Chick-N-Hutch” building to house a poultry operation. Schoen says the students will be able to raise roughly 160 chickens starting in late May. About 40-percent of the chickens will go the Logan County Fair. The rest will be processed and given to local food banks. Schoen estimates they will be able to donate approximately 500-pounds of chicken. Once the chicken projects are complete, Schoen plans to purchase 50 turkey chicks or “poults.” The students will raise the poults through out the fall. They hope to process and sell half the turkeys to customers. The other half they plan to donate families who might need a turkey for Thanksgiving. Schoen hopes the success of the program will lead to local sponsorships or further grant opportunities.